Born and raised in Ladner, B.C. Marilyn spent 7 years in Toronto where she graduated from the Toronto School of Art. 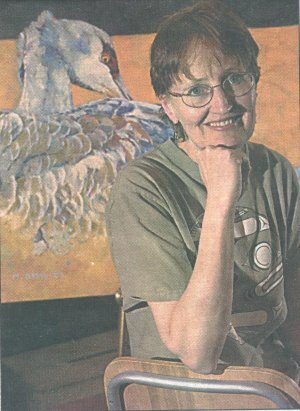 Her love of nature and animals has fueled her passion for artistic expression. Never content with just one style, she works in various mediums from abstract to representational and often something in between. The common thread is the spirit taking form through the work. Her mission is to share that gift of spirit. Thank you for taking the time to receive it. Soft pastels have always been one of my favourite mediums. I find the exquisite colours and the immediacy of application such a satisfying form of expression. My other favourite medium is oil. There is something in the way oils go on the canvas that just turns me on! What can I say? I love it. It’s a very forgiving medium and stylistically it is almost unlimited. Where the limitations of oil begin is where acrylic paints enter the scene for me. I love to glue and paint and glue and paint again. Glue doesn’t adhere well to oil, so acrylics do very nicely for that style of work. There is a simple joy in drawing and painting the human form. The relative quickness of the poses forces immediacy to the work. It allows me to be in the moment and focused. There is also a lovely camaraderie amongst our life-drawing group at the Longhouse Centre for the Visual Arts in Tsawwassen on Monday mornings. Doing Landscapes for me is a wonderful way of staying in tune with nature. I try to capture the experience of being in the moment in that special place. Animals have always been very near and dear to my heart. I have done commissioned portraits for about 30 years through which I have met many very precious beings, furry and otherwise.